Regulation (EC) No 595/2009 is one of the separate regulatory acts under the type-approval procedure laid down by Directive 2007/46/EC. It empowers the Commission to adopt measures relating to CO2 emissions and fuel consumption of heavy duty vehicles. The present Regulation aims at establishing measures for obtaining accurate information on CO2 emissions and fuel consumption of new heavy-duty vehicles placed on the Union market. Directive 2007/46/EC sets out the necessary requirements for the purpose of a whole vehicle type-approval. Commission Regulation (EU) No 582/2011 (3) sets out requirements for the approval of heavy-duty vehicles with regard to emissions and access to vehicle repair and maintenance information. Measures for the determination of CO2 emissions and fuel consumption of new heavy-duty vehicles should be part of the type-approval system instituted by this Regulation. A licence to perform simulations to establish CO2 emissions and fuel consumption of a vehicle will be required to obtain the approvals mentioned above. Emissions from lorries, buses and coaches, which are the most widely representative categories of heavy-duty vehicles, currently represent around 25 % of road transport CO2 emissions and are expected to increase even further in the future. In order to reach the target of a 60 % reduction of CO2 emissions from transport by 2050, effective measures to curb emissions from heavy-duty vehicles need to be introduced. Until now, no common method has been laid down by Union legislation to measure CO2 emissions and fuel consumption of heavy-duty vehicles, rendering it impossible to objectively compare performance of vehicles or to introduce measures, whether on the Union or national level, that would encourage the introduction of more energy-efficient vehicles. As a consequence, there has been no transparency in the market as regards the energy-efficiency of heavy-duty vehicles. The heavy-duty vehicle sector is very diversified, with a significant number of different vehicle types and models as well as with a high degree of customisation. The Commission has conducted an in-depth analysis of the available options to measure CO2 emissions and fuel consumption of those vehicles and concluded that in order to obtain unique data for each produced vehicle at the lowest cost, CO2 emissions and fuel consumption of heavy-duty vehicles should be determined using simulation software. In order to reflect the diversity of the sector, heavy-duty vehicles should be divided into groups of vehicles with a similar axle configuration, chassis configuration and technically permissible maximum laden mass. Those parameters define the purpose of a vehicle and should therefore determine the set of test cycles used for the purpose of the simulation. Since there is no software available on the market to meet the requirements necessary for the purposes of the assessment of CO2 emissions and fuel consumption of heavy-duty vehicles, the Commission should develop dedicated software to be used for those purposes. That software should be publically available, open-source, downloadable and executable. It should include a simulation tool for the calculation of CO2 emissions and fuel consumption of specific heavy-duty vehicles. The tool should be conceived to use, as input, the data reflecting the characteristics of the components, separate technical units and systems which have a significant impact on the CO2 emissions and fuel consumption of heavy-duty vehicles – engine, gearbox and additional driveline components, axles, tyres, aerodynamics and auxiliaries. The software should also include pre-processing tools to be used for the verification and pre-processing of the simulation tool input data relating to the engine and vehicle air drag, as well as a hashing tool to be used for the encryption of the simulation tool input and output files. In order to enable a realistic assessment, the simulation tool should be equipped with a number of functionalities allowing for a simulation of vehicles with different payloads and fuels over specific test cycles assigned to a vehicle depending on its application. Recognizing the importance of the proper functioning of the software for the correct determination of vehicles' CO2 emissions and fuel consumption and of keeping up with technological progress, the Commission should maintain the software and update it whenever necessary. The simulations should be performed by vehicle manufacturers before registration, sale or entry into service of a new vehicle in the Union. Provisions should also be put in place for the licence of the vehicle manufacturers' processes for calculation of the CO2 emissions and fuel consumption of vehicles. The processes of handling and application of data by the vehicle manufacturers for the purposes of calculation of the CO2 emissions and fuel consumption of vehicles using the simulation tool should be assessed and closely monitored by the approval authorities in order to ensure that the simulations are conducted in a correct manner. Provisions should therefore be put in place requiring vehicle manufacturers to acquire a licence for the operation of the simulation tool. The CO2 emissions and fuel consumption related properties of the components, separate technical units and systems having a significant impact on the CO2 emissions and fuel consumption of heavy-duty vehicles should be used as input for the simulation tool. In order to reflect the specificities of the individual components, separate technical units and systems and to allow for a more precise determination of their CO2 emissions and fuel consumption related properties, provisions for the certification of such properties on the basis of testing should be set out. For the purpose of limiting the costs of the certification, manufacturers should have the possibility to group into families components, separate technical units and systems with similar design and CO2 emission and fuel consumption characteristics. One component, separate technical unit or system per family with the least favourable characteristics as regards CO2 emissions and fuel consumption within that family should be tested and its results should apply to the entire family. The costs related to testing may constitute a significant obstacle in particular to companies manufacturing components, separate technical units or systems in small numbers. In order to provide an economically viable alternative to certification, standard values should be set out for certain components, separate technical units and systems with the possibility of using those values instead of the certified values determined on the basis of testing. Standard values should, however, be set out in a way to encourage suppliers of components, separate technical units and systems to apply for certification. In order to ensure that the results relating to CO2 emissions and fuel consumption declared by the suppliers of components, separate technical units and systems as well as vehicle manufacturers are correct, provisions for verifying and ensuring the conformity of the simulation tool operation as well as of the CO2 emissions and fuel consumption related properties of the relevant components, separate technical units and systems should be set out. In order to ensure sufficient lead time for the national authorities and the industry, the obligation to determine and declare CO2 emissions and fuel consumption of new vehicles should be implemented gradually for different vehicle groups starting with the vehicles which are the biggest contributors to CO2 emissions of the heavy-duty sector. The provisions set out in this Regulation form part of the framework established by Directive 2007/46/EC and complement the provisions for type approval with regard to emissions and vehicle repair and maintenance information laid down in Regulation (EU) No 582/2011. To establish a clear relationship between those provisions and this Regulation, Directive 2007/46/EC and Regulation (EU) No 582/2011 should be amended accordingly. This Regulation complements the legal framework for the type-approval of motor vehicles and engines with regard to emissions and vehicle repair and maintenance information established by Regulation (EU) No 582/2011 by laying down the rules for issuing licences to operate a simulation tool with a view to determining CO2 emissions and fuel consumption of new vehicles to be sold, registered or put into service in the Union and for operating that simulation tool and declaring the CO2 emissions and fuel consumption values thus determined. 1. Subject to the second paragraph of Article 4, this Regulation shall apply to vehicles of category N2, as defined in Annex II to Directive 2007/46/EC, with a technically permissible maximum laden mass exceeding 7 500 kg and to all vehicles of category N3, as defined in that Annex. 2. In case of multi-stage type-approvals of vehicles referred to in paragraph 1, this Regulation shall apply only to base vehicles equipped at least with a chassis, engine, transmission, axles and tyres. 3. This Regulation shall not apply to off-road vehicles, special purpose vehicles and off road special purpose vehicles as defined, respectively, in points 2.1., 2.2. and 2.3. of Part A of Annex II to Directive 2007/46/EC. ‘manufacturer’ means the person or body who is responsible to the approval authority for all aspects of the certification process and for ensuring conformity of CO2 emissions and fuel consumption related properties of components, separate technical units and systems. It is not essential that the person or body be directly involved in all stages of the construction of the component, separate technical unit or system which is the subject of the certification. ‘authorised entity’ means a national authority authorised by a Member State to request relevant information from the manufacturers and vehicle manufacturers on the CO2 emissions and fuel consumption related properties of a specific component, specific separate technical unit or specific system and CO2 emissions and fuel consumption of new vehicles respectively. For the purpose of this Regulation, motor vehicles shall be classified in vehicle groups in accordance with Table 1 in Annex I. Articles 5 to 22 do not apply to motor vehicles of vehicle groups 0, 6, 7, 8, 13, 14, 15 and 17. The Commission shall maintain the electronic tools and provide modifications and updates to those tools. 2. The Commission shall make the electronic tools referred to in paragraph 1 available through a publicly available dedicated electronic distribution platform. 3. The simulation tool shall be used for the purposes of determining CO2 emissions and fuel consumption of new vehicles. It shall be designed to operate on the basis of input information as specified in Annex III, as well as input data referred to in Article 12(1). 4. The pre-processing tools shall be used for the purpose of verification and compilation of the testing results and performing additional calculations relating to CO2 emission and fuel consumption related properties of certain components, separate technical units or systems and converting them in a format used by the simulation tool. The pre-processing tools shall be used by the manufacturer after performing the tests referred to in point 4 of Annex V for engines and in point 3 of Annex VIII for air-drag. 5. The hashing tools shall be used for establishing an unequivocal association between the certified CO2 emission and fuel consumption related properties of a component, separate technical unit or system and its certification document, as well as for establishing an unequivocal association between a vehicle and its manufacturer's records file as referred to in point 1of Annex IV. 1. The vehicle manufacturer shall submit to the approval authority an application for a licence to operate the simulation tool referred to in Article 5(3) with a view to determining CO2 emissions and fuel consumption of new vehicles belonging to one or more vehicle groups (‘licence’). 2. The application for a licence shall take the form of an information document drawn up in accordance with the model set out in Appendix 1 to Annex II. 3. The application for a licence shall be accompanied by an adequate description of the processes set up by the manufacturer for the purposes of determining CO2 emissions and fuel consumption with respect to all the vehicle groups concerned, as set out in point 1 of Annex II. It shall also be accompanied by the assessment report drafted by the approval authority after performing an assessment in accordance with point 2 of Annex II. 4. The vehicle manufacturer shall submit the application for a licence drawn up in accordance with paragraphs 2 and 3 to the approval authority at the latest together with the application for an EC type-approval of a vehicle with an approved engine system with regard to emissions and access to vehicle repair and maintenance information pursuant to Article 7 of Regulation (EU) No 582/2011, or with the application for an EC type-approval of a vehicle with regard to emissions and access to vehicle repair and maintenance information pursuant to Article 9 of that Regulation. The application for a licence must concern the vehicle group which includes the type of vehicle concerned by the application for EC type-approval. 1. The approval authority shall grant the licence if the manufacturer submits an application in accordance with Article 6 and proves that the requirements laid down in Annex II are met with respect to the vehicle groups concerned. Where the requirements laid down in Annex II are met only with respect to some of the vehicle groups specified in the application for a licence, the licence shall be granted only with respect to those vehicle groups. 2. The licence shall be issued in accordance with the model set out in Appendix 2 to Annex II. 1. A licence shall be extended to vehicle groups other than those to which a licence has been granted, as referred to in Article 7(1), if the vehicle manufacturer proves that the processes set up by him for the purposes of determining CO2 emissions and fuel consumption of vehicle groups covered by the licence fully meet the requirements of Annex II also in respect of the other vehicle groups. 2. The vehicle manufacturer shall apply for an extension of the licence in accordance with Article 6 (1), (2) and (3). 3. After obtaining the licence, the vehicle manufacturer shall notify the approval authority without delay of any changes to the processes set up by him for the purposes of determining CO2 emissions and fuel consumption for the vehicle groups covered by the licence that may effect on the accuracy, reliability and stability of those processes. 4. Upon receipt of the notification referred to in paragraph 3, the approval authority shall inform the vehicle manufacturer whether processes affected by the changes continue to be covered by the licence granted, whether the licence must be extended in accordance with paragraphs 1 and 2 or whether a new licence should be applied for in accordance with Article 6. 5. Where the changes are not covered by the licence, the manufacturer shall, within one month of receipt of the information referred to in paragraph 4, apply for an extension of the licence or for a new licence. If the manufacturer does not apply for an extension of the licence or a new licence within that deadline, or if the application is rejected, the licence shall be withdrawn. 1. A vehicle manufacturer shall determine the CO2 emissions and fuel consumption of each new vehicle to be sold, registered or put into service in the Union using the latest available version of the simulation tool referred to in Articles 5(3). A vehicle manufacturer may operate the simulation tool for the purposes of this Article only if in possession of a licence granted for the vehicle group concerned in accordance with Article 7 or extended to the vehicle group concerned in accordance with Article 8(1). 2. The vehicle manufacturer shall record the results of the simulation performed in accordance with the first subparagraph of paragraph 1 in the manufacturer's records file drawn up in accordance with the model set out in Part I of Annex IV. With the exception of the cases referred to in the second subparagraph of Article 21(3), and in Article 23(6), any subsequent changes to the manufacturer's records file shall be prohibited. 3. The manufacturer shall create a cryptographic hash of the manufacturer's records file using the hashing tool referred to in Article 5(5). 4. Each vehicle to be registered, sold or to enter into service shall be accompanied by the customer information file drawn up by the manufacturer in accordance with the model set out in Part II to Annex IV. Each customer information file shall include an imprint of the cryptographic hash of the manufacturer's records file referred to in paragraph 3. 5. Each vehicle to be registered, sold or to enter into service shall be accompanied by a certificate of conformity including an imprint of the cryptographic hash of the manufacturer's records file referred to in paragraph 3. The first subparagraph shall not apply in the case of vehicles approved in accordance with Article 24 of Directive 2007/46/EC. 1. In the case of modifications or updates to the simulation tool, the vehicle manufacturer shall start using the modified or updated simulation tool no later than 3 months after the modifications and updates were made available on the dedicated electronic distribution platform. 2. If the CO2 emissions and fuel consumption of new vehicles cannot be determined in accordance with Article 9(1) due to a malfunction of the simulation tool, the vehicle manufacturer shall notify the Commission thereof without delay by means of the dedicated electronic distribution platform. 3. If the CO2 emissions and fuel consumption of new vehicles cannot be determined in accordance with Article 9(1) due to a malfunction of the simulation tool, the vehicle manufacturer shall perform the simulation of those vehicles not later than 7 calendar days after the date referred to in point 1. Until then, the obligations resulting from Article 9 for the vehicles for which the determination of fuel consumption and CO2 emissions remains impossible shall be suspended. 1. The manufacturer's records file together with certificates on CO2 emissions and fuel consumption related properties of the components, systems and separate technical units shall be stored by the vehicle manufacturer for at least 20 years after the production of the vehicle and shall be available to the approval authority and the Commission at their request. 2. Upon request by an authorized entity of a Member State or by the Commission, the vehicle manufacturer shall provide, within 15 working days, the manufacturer's records file. 3. Upon request by an authorised entity of a Member State or by the Commission, the approval authority which granted the licence in accordance with Article 7 or certified the CO2 emissions and fuel consumption related properties of a component, separate technical unit or system in accordance with Article 17 shall provide, within 15 working days, the information document referred to in Article 6(2) or in Article 16(2), respectively. 2. The CO2 emissions and fuel consumption related properties of the components, separate technical units and systems referred to in points (b) to (g) and (i) of paragraph 1 shall be based either on the values determined, for each component family, separate technical unit family or system family, in accordance with Article 14 and certified in accordance with Article 17 (‘certified values’) or, in the absence of the certified values, on the standard values determined in accordance with Article 13. 3. The CO2 emissions and fuel consumption related properties of engines shall be based on the values determined for each engine family in accordance with Article 14 and certified in accordance with Article 17. 4. The CO2 emissions and fuel consumption related properties of auxiliaries shall be based on the standard values determined in accordance with Article 13. 5. In the case of a base vehicle referred to in Article 2(2), the CO2 emissions and fuel consumption related properties of components, separate technical units and systems referred to in points (g) and (h) of paragraph 1 which cannot be determined for the base vehicle shall be based on the standard values. For components, separate technical units and systems referred to in point (h), the technology with highest power losses shall be selected by the vehicle manufacturer. 1. The standard values for transmissions shall be determined in accordance with Appendix 8 of Annex VI. 2. The standard values for torque converters shall be determined in accordance with Appendix 9 of Annex VI. 3. The standard values for other torque-transferring components shall be determined in accordance with Appendix 10 of Annex VI. 4. The standard values for additional driveline components shall be determined in accordance with Appendix 11 of Annex VI. 5. The standard values for axles shall be determined in accordance with Appendix 3 of Annex VII. 6. The standard values for a body or trailer air drag shall be determined in accordance with Appendix 7 of Annex VIII. 7. The standard values for auxiliaries shall be determined in accordance with Annex IX. 8. The standard value for tyres shall be the one for C3 tyres as set out in Table 2 of Part B of Annex II to Regulation (EC) No 661/2009 of the European Parliament and of the Council (4). 1. The values determined in accordance with paragraphs 2 to 9 may be used by the vehicle manufacturer as the simulation tool input data if they are certified in accordance with Article 17. 2. The certified values for engines shall be determined in accordance with point 4 of Annex V.
3. The certified values for transmissions shall be determined in accordance with point 3 of Annex VI. 4. The certified values for torque converters shall be determined in accordance with point 4 of Annex VI. 5. The certified values for other torque-transferring component shall be determined in accordance with point 5 of Annex VI. 6. The certified values for additional driveline components shall be determined in accordance with point 6 of Annex VI. 7. The certified values for axles shall be determined in accordance with point 4 of Annex VII. 8. The certified values for a body or trailer air drag shall be determined in accordance with point 3 of Annex VIII. 9. The certified values for tyres shall be determined in accordance with Annex X. Appendix 5 to Annex VIII as regards the family concept for the purposes of determining air drag. 2. Notwithstanding paragraph 1, for engines, the certified values for all the members of an engine family created in accordance with the family definition as set out in Appendix 3 to Annex V, shall be derived in accordance with paragraph 4, 5 and 6 of Annex V.
For tyres, a family shall consist of one tyre type only. 3. The CO2 emissions and fuel consumption related properties of the parent component, parent separate technical unit or parent system shall not be better than the properties of any member of the same family. 4. The manufacturer shall provide the approval authority with evidence that the parent component, separate technical units or system fully represents the component family, separate technical unit family or system family. If, in the framework of testing for the purposes of the second subparagraph of Article 16(3), the approval authority determines that the selected parent component, parent separate technical unit or parent system does not fully represent the component family, separate technical unit family or system family, an alternative reference component, separate technical units or system may be selected by the approval authority, tested and shall become a parent component, parent separate technical unit or parent system. 5. Upon request of the manufacturer, and subject to the agreement by the approval authority, the CO2 emissions and fuel consumption related properties of a specific component, specific separate technical unit or specific system other than a parent component, parent separate technical unit or parent system, respectively, may be indicated in the certificate on CO2 emissions and fuel consumption related properties of the component family, separate technical unit family or system family. The CO2 emissions and fuel consumption related properties of that specific component, separate technical unit or system shall be determined in accordance with Article 14. 6. Where the characteristics of the specific component, specific separate technical unit or specific system, in terms of CO2 emissions and fuel consumption related properties as determined in accordance with paragraph 5, lead to higher CO2 emissions and fuel consumption values than those of the parent component, parent separate technical unit or parent system, respectively, the manufacturer shall exclude it from the existing family, assign it to a new family and define it as the new parent component, parent separate technical unit or parent system for that family or apply for an extension of the certification pursuant to Article 18. 1. The application for certification of the CO2 emissions and fuel consumption related properties of the component family, separate technical unit family or system family shall be submitted to the approval authority. Appendix 2 to Annex X as regards tyres. 3. The application for certification shall be accompanied by an explanation of the elements of design of the component family, separate technical unit family or the system family concerned which have a non-negligible effect on the CO2 emissions and fuel consumption related properties of the components, separate technical units or systems concerned. The application shall also be accompanied by the relevant test reports issued by an approval authority, test results, and by a statement of compliance issued by an approval authority pursuant to point 1 of Annex X of Directive 2007/46/EC. 1. If all the applicable requirements are met, the approval authority shall certify the values relating to the CO2 emissions and fuel consumption related properties of the component family, separate technical unit family or system family concerned. Appendix 1 to Annex X as regards tyres. The approval authority shall not assign the same number to another component family, separate technical unit family or system family. The certification number shall be used as the identifier of the test report. 4. The approval authority shall create a cryptographic hash of the file with test results, comprising the certification number, by means of the hashing tool referred to in Article 5(5). This hashing shall be done immediately after the test results are produced. The approval authority shall imprint that hash along with the certification number on the certificate on CO2 emissions and fuel consumption related properties. In such cases, the approval authority shall issue a revised certificate denoted by an extension number. The manufacturer shall modify the information document referred to in Article 16(2) and provide it to the approval authority. 2. Where the characteristics of the specific component, specific separate technical unit or specific system, in terms of CO2 emissions and fuel consumption related properties as determined in accordance with paragraph 1, lead to higher CO2 emissions and fuel consumption values than those of the parent component, parent separate technical unit or parent system, respectively, the new component, separate technical unit or system shall become the new parent component, separate technical unit or system. 1. The manufacturer shall notify the approval authority of any changes to the design or the manufacturing process of components, separate technical units or systems concerned which occur after the certification of the values relating to the CO2 emissions and fuel consumption related properties of the relevant component family, separate technical unit family or system family pursuant to Article 17 and which may have a non-negligible effect on the CO2 emissions and fuel consumption related properties of those components, separate technical units and systems. 2. Upon receipt of the notification referred to in paragraph 1, the approval authority shall inform the manufacturer whether or not the components, separate technical units or systems affected by the changes continue to be covered by the certificate issued, or whether additional testing in accordance with Article 14 is necessary in order to verify the impact of the changes on the CO2 emissions and fuel consumption related properties of the components, separate technical units or systems concerned. 3. Where the components, separate technical units or systems affected by the changes are not covered by the certificate, the manufacturer shall, within one month of receipt of that information from the approval authority, apply for a new certification or an extension pursuant to Article 18. If the manufacturer does not apply for a new certification or an extension within that deadline, or if the application is rejected, the certificate shall be withdrawn. 1. The vehicle manufacturer shall take the necessary measures to ensure that the processes set up for the purposes of determining CO2 emissions and fuel consumption for all the vehicle groups covered by the licence granted pursuant to Article 7 or the extension to the licence pursuant to Article 8(1) continue to be adequate for that purpose. 1. Where the approval authority finds, pursuant to Article 20(2), that the processes set up by the vehicle manufacturer for the purposes of determining the CO2 emissions and fuel consumption of the vehicle groups concerned are not in accordance with the licence or with this Regulation or may lead to an incorrect determination of the CO2 emissions and fuel consumption of the vehicles concerned, the approval authority shall request the manufacturer to submit a plan of remedial measures no later than 30 calendar days after receipt of the request from the approval authority. Where the vehicle manufacturer demonstrates that further time is necessary for the submission of the plan of remedial measures, an extension of up to 30 calendar days may be granted by the approval authority. 2. The plan of remedial measures shall apply to all vehicle groups which have been identified by the approval authority in its request. 3. The approval authority shall approve or reject the plan of remedial measures within 30 calendar days of its receipt. The approval authority shall notify the manufacturer and all the other Member States of its decision to approve or reject the plan of remedial measures. The approval authority may require the vehicle manufacturer to issue a new manufacturer's records file, customer information file and certificate of conformity on the basis of a new determination of CO2 emissions and fuel consumption reflecting the changes implemented in accordance with the approved plan of remedial measures. 4. The manufacturer shall be responsible for the execution of the approved plan of remedial measures. 5. Where the plan of the remedial measures has been rejected by the approval authority, or the approval authority establishes that the remedial measures are not being correctly applied, it shall take the necessary measures to ensure the conformity of simulation tool operation, or withdraw the licence. 1. The manufacturer shall take the necessary measures in accordance to Annex X to Directive 2007/46/EC to ensure that the CO2 emissions and fuel consumption related properties of the components, separate technical units and systems listed in Article 12(1) which have been the subject of certification in accordance with Article 17 do not deviate from the certified values. the procedures laid down in point 4 of Annex X as regards tyres. Where CO2 emissions and fuel consumption related properties of a member of a component family, separate technical unit family or system family have been certified in accordance with Article 15(5), the reference value for the verification of the CO2 emissions and fuel consumption related properties shall be the one certified for this family member. Where a deviation from the certified values is identified as a result of the measures referred to in the first and second subparagraphs, the manufacturer shall immediately inform the approval authority thereof. 2. The manufacturer shall provide, on an annual basis, testing reports containing the results of the procedures referred to in the second subparagraph of paragraph 1 to the approval authority which certified the CO2 emissions and fuel consumption related properties of the component family, separate technical unit family or system family concerned. The manufacturer shall make the test reports available to the Commission upon request. 3. The manufacturer shall ensure that at least one in every 25 procedures referred to in the second subparagraph of paragraph 1, or, with an exception for tyres, at least one procedure per year, relating to a component family, separate technical unit family or system family is supervised by a different approval authority than the one which participated in the certification of CO2 emissions and fuel consumption related properties of the component family, separate technical unit family or system family concerned pursuant to Article 16. 4. Any approval authority may at any time perform verifications relating to the components, separate technical units and systems at any of the manufacturer's and vehicle manufacturer's facilities in order to verify whether the CO2 emissions and fuel consumption related properties of those components, separate technical units and systems do not deviate from the certified values. The manufacturer and the vehicle manufacturer shall provide the approval authority within 15 working days of the approval authority's request with all the relevant documents, samples and other materials in his possession and necessary to perform the verifications relating to a component, separate technical unit or system. 1. Where the approval authority finds, pursuant to Article 22, that the measures taken by the manufacturer to ensure that the CO2 emissions and fuel consumption related properties of the components, separate technical units and systems listed in Article 12(1) and which have been the subject of certification in accordance with Article 17 do not deviate from the certified values are not adequate, the approval authority shall request the manufacturer to submit a plan of remedial measures no later than 30 calendar days after receipt of the request from the approval authority. Where the manufacturer demonstrates that further time is necessary for the submission of the plan of remedial measures, an extension of up to 30 calendar days may be granted by the approval authority. 2. The plan of remedial measures shall apply to all the component families, separate technical unit families or system families which have been identified by the approval authority in its request. The approval authority may require the vehicle manufacturers who installed the components, separate technical units and systems concerned in their vehicles to issue a new manufacturer's records file, customers information file and certificate of conformity on the basis of the CO2 emissions and fuel consumption related properties of those components, separate technical units and systems obtained by means of the measures referred to in Article 22(1). 5. The manufacturer shall keep a record of every component, separate technical unit or system recalled and repaired or modified and of the workshop which performed the repair. The approval authority shall have access to those records on request during the execution of the plan of the remedial measures and for a period of 5 years after the completion of its execution. 6. Where the plan of remedial measures has been rejected by the approval authority, or the approval authority establishes that the remedial measures are not being correctly applied, it shall take the necessary measures to ensure the conformity of CO2 emissions and fuel consumption related properties of the component family, separate technical unit family and system family concerned, or withdraw the certificate on CO2 emissions and fuel consumption related properties. vehicles in the groups 11, 12 and 16, as defined in Table 1 of Annex I, as from 1 July 2020. 2. Notwithstanding paragraph 1(a), the obligations referred to in Article 9 shall apply from 1 January 2019 with regard to all vehicles in the groups 4, 5, 9 and 10 with production date on or after 1 January 2019. The production date shall be the date of signature of the certificate of conformity or the date of issue of the individual approval certificate. Annexes I, III, IV, IX and XV to Directive 2007/46/EC are amended in accordance with Annex XI to this Regulation. ‘In order to receive an EC type-approval of a vehicle with an approved engine system with regard to emissions and vehicle repair and maintenance information, or an EC type-approval of a vehicle with regard to emissions and vehicle repair and maintenance information, the manufacturer shall also demonstrate that the requirements laid down in Article 6 and Annex II to Commission Regulation (EU) 2017/2400 (*1) are met with respect to the vehicle group concerned. However, that requirement shall not apply where the manufacturer indicates that new vehicles of the type to be approved will not be registered, sold or put into service in the Union on or after the dates laid down in points (a), (b) and (c) of paragraph 1 of Article 24 of Regulation (EU) 2017/2400 for the respective vehicle group. (*1) Commission Regulation (EU) 2017/2400 of 12 December 2017 implementing Regulation (EC) No 595/2009 of the European Parliament and of the Council as regards the determination of the CO2 emissions and fuel consumption of heavy-duty vehicles and amending Directive 2007/46/EC of the European Parliament and of the Council and Commission Regulation (EU) No 582/2011 (OJ L 349, 29.12.2017, p. 1).’;"
the requirements laid down in Article 6 and Annex II to Regulation (EU) 2017/2400 are met with respect to the vehicle group concerned, except where the manufacturer indicates that new vehicles of the type to be approved will not be registered, sold or put into service in the Union on or after the dates laid down in points (a), (b) and (c) of paragraph 1 of Article 24 of that Regulation for the respective vehicle group.’. (4) Regulation (EC) No 661/2009 of the European Parliament and of the Council of 13 July 2009 concerning type-approval requirements for the general safety of motor vehicles, their trailers and systems, components and separate technical units intended therefor (OJ L 200, 31.7.2009, p. 1). enable tracing of the components, separate technical units and systems after the vehicle is produced. Process for consulting the dedicated electronic distribution platform referred to in Article 5(2) and Article 10(1) and (2), as well as downloading and installing the latest versions of the simulation tool. Appropriate training of staff working with the simulation tool. The approval authority shall verify whether the processes set out in point 1 related to the operation of the simulation tool have been set up. the completeness of the description of the data and process flows of operations related to the determination of the CO2 emissions and fuel consumption of the vehicles. For the purpose of point (a) of the second paragraph, The verification shall include determination of the CO2 emissions and fuel consumption of at leaste one vehicle from each of the vehicle groups for which the licence has been applied for. of the licence to operate simulation tool with regard to Regulation (EC) No 595/2009 as implemented by Regulation (EU) 2017/2400. This Annex describes the list of parameters to be provided by the vehicle manufacturer as input to the simulation tool. The applicable XML schema as well as example data are available at the dedicated electronic distribution platform. ‘corrected actual mass of the vehicle’ shall mean the mass as specified under the ‘actual mass of the vehicle’ in accordance with Commission Regulation (EC) No 1230/2012 (1) with an exception for the tank(s) which shall be filled to at least 50 % of its or their capacity/ies, without superstructure and corrected by the additional weight of the non-installed standard equipment as specified in point 4.3 and the mass of a standard body, standard semi-trailer or standard trailer to simulate the complete vehicle or complete vehicle-(semi-)trailer combination. All parts that are mounted on and above the main frame are regarded as superstructure parts if they are only installed for facilitating a superstructure, independent of the necessary parts for in running order conditions. 4.1 The vehicle mass used as input for the simulation tool shall be the corrected actual mass of the vehicle. This corrected actual mass shall be based on vehicles equipped in such a way that they are compliant to all regulatory acts of Annex IV and Annex XI to Directive 2007/46/EC applicable to the particular vehicle class. For the highest 50 % of the gears (e.g. for gears 7 to 12 of a 12 gear transmission) the vehicle manufacturer may declare a gear dependent maximum engine torque limit which is not higher than 95 % of the maximum engine torque. 7.1. The engine idling speed has to be declared in VECTO for each individual vehicle. This declared vehicle engine idling shall be equal or higher than specified in the engine input data approval. (1) Commission Regulation (EU) No 1230/2012 of 12 December 2012 implementing Regulation (EC) No 661/2009 of the European Parliament and of the Council with regard to type-approval requirements for masses and dimensions of motor vehicles and their trailers and amending Directive 2007/46/EC of the European Parliament and of the Council (OJ L 353, 21.12.2012, p. 31). The engine test procedure described in this Annex shall produce input data relating to engines for the simulation tool. ‘Full load’ means the delivered engine torque/power at a certain engine speed when the engine is operated at maximum operator demand. The definitions in paragraphs 3.1.5 and 3.1.6. of Annex 4 to UN/ECE Regulation 49 Rev.06 shall not apply. The calibration laboratory facilities shall comply with the requirements of either ISO/TS 16949, ISO 9000 series or ISO/IEC 17025. All laboratory reference measurement equipment, used for calibration and/or verification, shall be traceable to national or international standards. Engines shall be grouped into engine CO2-families defined in accordance with Appendix 3. Paragraph 4.1 explains which testruns shall be performed for the purpose of certification of one specific engine CO2-family. All testruns performed for the purpose of certification of one specific engine CO2-family defined in accordance with Appendix 3 to this Annex shall be conducted on the same physical engine and without any changes to the setup of the engine dynamometer and the engine system, apart from the exceptions defined in paragraph 4.2 and Appendix 3. The parameter fa describing the laboratory test conditions, determined in accordance with paragraph 6.1 of Annex 4 to UN/ECE Regulation 49 Rev.06, shall be within the following limits: 0,96 ≤ fa ≤ 1,04. The absolute temperature (Ta) of the engine intake air expressed in Kelvin, determined in accordance with paragraph 6.1 of Annex 4 to UN/ECE Regulation 49 Rev.06 shall be within the following limits: 283 K ≤ Ta ≤ 303 K.
The atmospheric pressure expressed in kPa, determined in accordance with paragraph 6.1 of Annex 4 to UN/ECE Regulation 49 Rev.06 shall be within the following limits: 90 kPa ≤ ps ≤ 102 kPa. If tests are performed in test cells that are able to simulate barometric conditions other than those existing in the atmosphere at the specific test site, the applicable fa value shall be determined with the simulated values of atmospheric pressure by the conditioning system. The same reference value for the simulated atmospheric pressure shall be used for the intake air and exhaust path and all other relevant engine systems. The actual value of the simulated atmospheric pressure for the intake air and exhaust path and all other relevant engine systems shall be within the limits specified in subpoint (3). In cases where the ambient pressure in the atmosphere at the specific test site exceeds the upper limit of 102 kPa, tests in accordance with this Annex may still be performed. In this case tests shall be performed with the specific ambient air pressure in the atmosphere. In cases where the test cell has the ability to control temperature, pressure and/or humidity of engine intake air independent of the atmospheric conditions the same settings for those parameters shall be used for all testruns performed for the purpose of certification of one specific engine CO2-family defined in accordance with Appendix 3 to this Annex. The test engine shall be installed in accordance with paragraphs 6.3 to 6.6 of Annex 4 to UN/ECE Regulation 49 Rev.06. If auxiliaries/equipment necessary for operating the engine system are not installed as required in accordance with paragraph 6.3 of Annex 4 to UN/ECE Regulation 49 Rev.06, all measured engine torque values shall be corrected for the power required for driving these components for the purpose of this Annex in accordance with paragraph 6.3 of Annex 4 to UN/ECE Regulation 49 Rev.06. In the case of a closed crankcase, the manufacturer shall ensure that the engine's ventilation system does not permit the emission of any crankcase gases into the atmosphere. If the crankcase is of an open type, the emissions shall be measured and added to the tailpipe emissions, following the provisions set out in paragraph 6.10. of Annex 4 to UN/ECE Regulation 49 Rev.06. During all testruns the charge air cooling system used on the test bed shall be operated under conditions which are representative for in-vehicle application at reference ambient conditions. The reference ambient conditions are defined as 293 K for air temperature and 101,3 kPa for pressure. The laboratory charge air cooling for tests according to this regulation should comply with the provisions specified in paragraph 6.2 of Annex 4 to UN/ECE Regulation 49 Rev.06. During all testruns the engine cooling system used on the test bed shall be operated under conditions which are representative for in-vehicle application at reference ambient conditions. The reference ambient conditions are defined as 293 K for air temperature and 101,3 kPa for pressure. The engine cooling system should be equipped with thermostats according to the manufacturer specification for vehicle installation. If either a non-operational thermostat is installed or no thermostat is used, subpoint (3) shall apply. The setting of the cooling system shall be performed in accordance with subpoint (4). If no thermostat is used or a non-operational thermostat is installed, the test bed system shall reflect the behavior of the thermostat under all test conditions. The setting of the cooling system shall be performed in accordance with subpoint (4). The engine coolant flow rate (or alternatively the pressure differential across the engine side of the heat exchanger) and the engine coolant temperature shall be set to a value representative for in-vehicle application at reference ambient conditions when the engine is operated at rated speed and full load with the engine thermostat in fully open position. This setting defines the coolant reference temperature. For all testruns performed for the purpose of certification of one specific engine within one engine CO2-family, the cooling system setting shall not be changed, neither on the engine side nor on the test bed side of the cooling system. The temperature of the test bed side cooling medium should be kept resonably constant by good engineering judgement. The cooling medium on the test bed side of the heat exchanger shall not exceed the nominal thermostat opening temperatur downstream of the heat exchanger. For all testruns performed for the purpose of certification of one specific engine within one engine CO2-family the engine coolant temperature shall be maintained between the nominal value of the thermostat opening temperature declared by the manufacturer and the coolant reference temperature in accordance with subpoint (4) as soon as the engine coolant has reached the declared thermostat opening temperature after engine cold start. For the WHTC coldstart test performed in accordance with paragraph 4.3.3, the specific initial conditions are specified in paragraphs 7.6.1. and 7.6.2 of Annex 4 to UN/ECE Regulation 49 Rev.06. If simulation of the thermostat behaviour in accordance with subpoint (3) is applied, there shall be no coolant flow across the heat exchanger as long as the engine coolant has not reached the declared nominal thermostat opening temperature after cold start. The respective reference fuel for the engine systems under test shall be selected from the fuel types listed in Table 1. The fuel properties of the reference fuels listed in Table 1 shall be those specified in Annex IX to Commission Regulation (EU) No 582/2011. To ensure that the same fuel is used for all testruns performed for the purpose of certification of one specific engine CO2-family no refill of the tank or switch to another tank supplying the engine system shall occur. Exceptionally a refill or switch may be allowed if it can be ensured that the replacement fuel has exactly the same properties as the fuel used before (same production batch). The NCV for the fuel used shall be determined by two separate measurements in accordance with the respective standards for each fuel type defined in Table 1. The two separate measurements shall be performed by two different labs independent from the manufacturer applying for certification. The lab performing the measurements shall comply with the requirements of ISO/IEC 17025. The approval authority shall ensure that the fuel sample used for determination of the NCV is taken from the batch of fuel used for all testruns. If the two separate values for the NCV are deviating by more than 440 Joule per gram fuel, the values determined shall be void and the measurement campaign shall be repeated. The mean value of the two separate NCV that are not deviating by more than 440 Joule per gram fuel shall be documented in MJ/kg rounded to 3 places to the right of the decimal point in accordance with ASTM E 29-06. For gas fuels the standards for determining the NCV according to Table 1 contain the calculation of the calorific value based on the fuel composition. The gas fuel composition for determining the NCV shall be taken from the analysis of the reference gas fuel batch used for the certification tests. For the determination of the gas fuel composition used for determining the NCV only one single analysis by a lab independent from the manufacturer applying for certification shall be performed. For gas fuels the NCV shall be determined based on this single analysis instead of a mean value of two separate measurements. The lubricating oil for all testruns performed in accordance with this Annex shall be a commercially available oil with unrestricted manufacturer approval under normal in-service conditions as defined in paragraph 4.2 of Annex 8 to UN/ECE Regulation 49 Rev.06. Lubricants for which the usage is restricted to certain special operation conditions of the engine system or having an unusually short oil change interval shall not be used for the purpose of testruns in accordance with this Annex. The commercially available oil shall not be modified by any means and no additives shall be added. All testruns performed for the purpose of certification of the CO2 emissions and fuel consumption related properties of one specific engine CO2-family shall be performed with the same type of lubricating oil. All fuel flows consumed by the whole engine system shall be captured by the fuel flow measurement system. Additional fuel flows not directly supplied to the combustion process in the engine cylinders shall be included in the fuel flow signal for all testruns performed. Additional fuel injectors (e.g. cold start devices) not necessary for the operation of the engine system shall be disconnected from the fuel supply line during all testruns performed. The measurement equipment shall meet the requirements of paragraph 9 of Annex 4 to UN/ECE Regulation 49 Rev.06. Notwithstanding the requirements defined in paragraph 9 of Annex 4 to UN/ECE Regulation 49 Rev.06, the measurement systems listed in Table 2 shall meet the limits defined in Table 2. ‘xmin’, used for calculation of the intercept value in Table 2, shall be 0,9 times the minimum predicted value expected during all testruns for the respective measurement system. The signal delivery rate of the measurement systems listed in Table 2, except for the fuel mass flow measurement system, shall be at least 5 Hz (≥ 10 Hz recommended). The signal delivery rate of the fuel mass flow measurement system shall be at least 2 Hz. All measurement data shall be recorded with a sample rate of at least 5 Hz (≥ 10 Hz recommended). A verification of the demanded requirements defined in Table 2 shall be performed for each measurement system. At least 10 reference values between xmin and the ‘max calibration’ value defined in accordance with paragraph 3.5 shall be introduced to the measurement system and the response of the measurement system shall be recorded as measured value. For the linearity verification the measured values shall be compared to the reference values by using a least squares linear regression in accordance with paragraph A.3.2 of Appendix 3 to Annex 4 to UN/ECE Regulation 49 Rev.06. All measurement data shall be determined in accordance with Annex 4 to UN/ECE Regulation 49 Rev.06, unless stated otherwise in this Annex. Table 3 gives an overview of all testruns to be performed for the purpose of certification of one specific engine CO2-family defined in accordance with Appendix 3. The fuel consumption mapping cycle in accordance with paragraph 4.3.5 and the recording of the engine motoring curve in accordance with paragraph 4.3.2 shall be omitted for all other engines except the CO2-parent engine of the engine CO2-family. In the case that upon request of the manufacturer the provisions defined in Article 15(5) of this Regulation are applied, the fuel consumption mapping cycle in accordance with paragraph 4.3.5 and the recording of the engine motoring curve in accordance with paragraph 4.3.2 shall be performed additionally for that specific engine. Changing of the target value for the engine idle speed controller to a lower value in the electronic control unit of the engine shall be allowed for all testruns in which idle operation occurs, in order to prevent interference between the engine idle speed controller and the test bed speed controller. The engine full load curve shall be recorded in accordance with paragraphs 7.4.1. to 7.4.5. of Annex 4 to UN/ECE Regulation 49 Rev.06. The recording of the engine motoring curve in accordance with this paragraph shall be omitted for all other engines except the CO2-parent engine of the engine CO2-family defined in accordance with Appendix 3. In accordance with paragraph 6.1.3 the engine motoring curve recorded for the CO2-parent engine of the engine CO2-family shall also be applicable to all engines within the same engine CO2-family. In the case that upon request of the manufacturer the provisions defined in Article 15(5) of this Regulation are applied, the recording of the engine motoring curve shall be performed additionally for that specific engine. The engine motoring curve shall be recorded in accordance with option (b) in paragraph 7.4.7. of Annex 4 to UN/ECE Regulation 49 Rev.06. This test shall determine the negative torque required to motor the engine between maximum and minimum mapping speed with minimum operator demand. The test shall be continued directly after the full load curve mapping according to paragraph 4.3.1. At the request of the manufacturer, the motoring curve may be recorded separately. In this case the engine oil temperature at the end of the full load curve testrun performed in accordance with paragraph 4.3.1 shall be recorded and the manufacturer shall prove to the satisfaction of the an approval authority, that the engine oil temperature at the starting point of the motoring curve meets the aforementioned temperature within ± 2 K.
At the start of the testrun for the engine motoring curve the engine shall be operated with minimum operator demand at maximum mapping speed defined in paragraph 7.4.3. of Annex 4 to UN/ECE Regulation 49 Rev.06. As soon as the motoring torque value has stabilized within ± 5 % of its mean value for at least 10 seconds, the data recording shall start and the engine speed shall be decreased at an average rate of 8 ± 1 min– 1/s from maximum to minimum mapping speed, which are defined in paragraph 7.4.3. of Annex 4 to UN/ECE Regulation 49 Rev.06. The WHTC test shall be performed in accordance with Annex 4 to UN/ECE Regulation 49 Rev.06. The weighted emission test results shall meet the applicable limits defined in Regulation (EC) No 595/2009. The engine full load curve recorded in accordance with paragraph 4.3.1 shall be used for the denormalization of the reference cycle and all calculations of reference values performed in accordance with paragraphs 7.4.6, 7.4.7 and 7.4.8 of Annex 4 to UN/ECE Regulation 49 Rev.06. In addition to the provisions defined in Annex 4 to UN/ECE Regulation 49 Rev.06 the actual fuel mass flow consumed by the engine in accordance with paragraph 3.4 shall be recorded. The WHSC test shall be performed in accordance with Annex 4 to UN/ECE Regulation 49 Rev.06. The emission test results shall meet the applicable limits defined in Regulation (EC) No 595/2009. The fuel consumption mapping cycle (FCMC) in accordance with this paragraph shall be omitted for all other engines except the CO2-parent engine of the engine CO2-family. The fuel map data recorded for the CO2-parent engine of the engine CO2-family shall also be applicable to all engines within the same engine CO2-family. In the case that upon request of the manufacturer the provisions defined in Article 15(5) of this Regulation are applied, the fuel consumption mapping cycle shall be performed additionally for that specific engine. The engine fuel map shall be measured in a series of steady state engine operation points, as defined according to paragraph 4.3.5.2. The metrics of this map are the fuel consumption in g/h depending on engine speed in min-1 and engine torque in Nm. If an after-treatment regeneration event occurs during the FCMC for engines equipped with exhaust after-treatment systems that are regenerated on a periodic basis defined in accordance with paragraph 6.6 of Annex 4 to UN/ECE Regulation 49 Rev.06, all measurements at that engine speed mode shall be void. The regeneration event shall be completed and afterwards the procedure shall be continued as described in paragraph 4.3.5.1.1. The engine shall be started and warmed up in accordance with paragraph 7.4.1. of Annex 4 to UN/ECE Regulation 49 Rev.06. After warm-up, the engine shall be preconditioned by operating the engine for 20 minutes at mode 9, as defined in Table 1 of paragraph 7.2.2. of Annex 4 to UN/ECE Regulation 49 Rev.06. The engine full load curve recorded in accordance with paragraph 4.3.1 shall be used for the denormalization of the reference values of mode 9 performed in accordance with paragraphs 7.4.6, 7.4.7 and 7.4.8 of Annex 4 to UN/ECE Regulation 49 Rev.06. 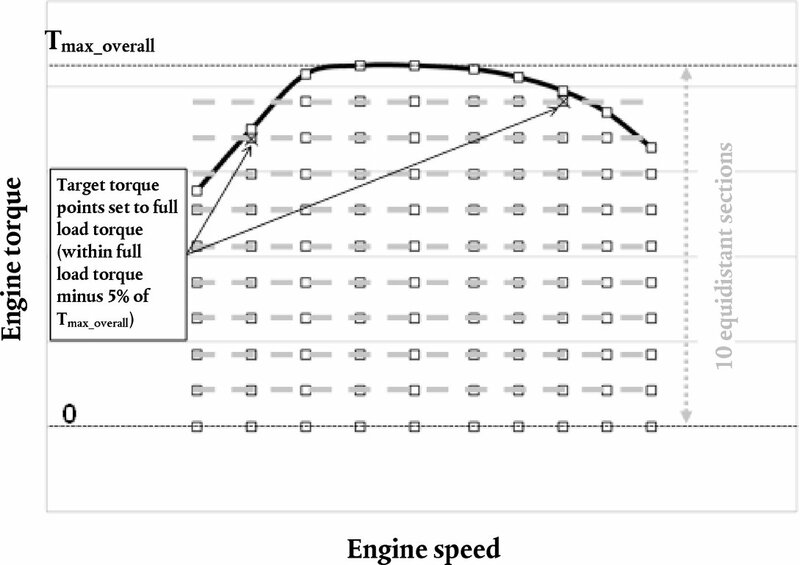 Directly after completion of preconditioning, the target values for engine speed and torque shall be changed linearly within 20 to 46 seconds to the highest target torque setpoint at the next higher target engine speed setpoint than the particular target engine speed setpoint where the interruption of the FCMC occurred. If the target setpoint is reached within less than 46 seconds, the remaining time up to 46 seconds shall be used for stabilization. For stabilization the engine operation shall continue from that point in accordance with the test sequence specified in paragraph 4.3.5.5 without recording of measurement values. When the highest target torque setpoint at the particular target engine speed setpoint where the interruption occurred is reached, the recording of measurement values shall be continued from that point on in accordance with the test sequence specified in paragraph 4.3.5.5. The grid of target setpoints is fixed in a normalized way and consists of 10 target engine speed setpoints and 11 target torque setpoints. Conversion of the normalized setpoint definition to the actual target values of engine speed and torque setpoints for the individual engine under test shall be based on the engine full load curve of the CO2-parent engine of the engine CO2-family defined in accordance with Appendix 3 to this Annex and recorded in accordance with paragraph 4.3.1. The 10 target engine speed setpoints are defined by 4 base target engine speed setpoints and 6 additional target engine speed setpoints. 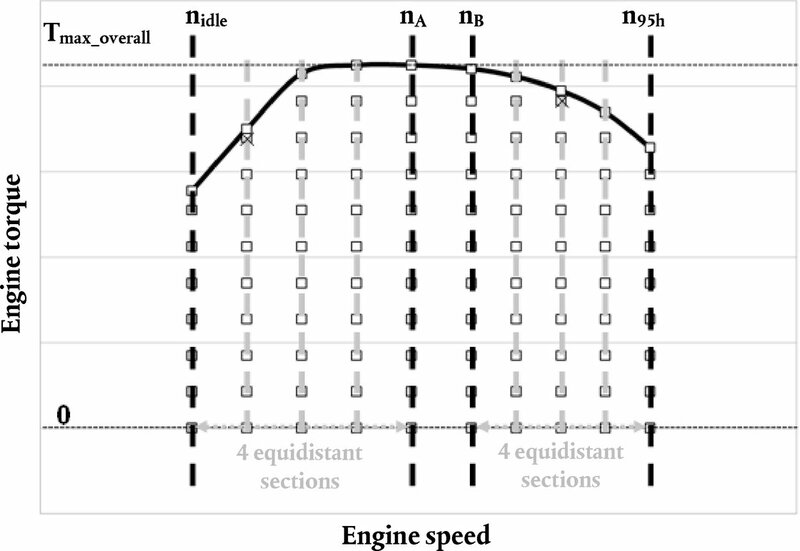 The engine speeds nidle, nlo, npref, n95h and nhi shall be determined from the engine full load curve of the CO2-parent engine of the engine CO2-family defined in accordance with Appendix 3 to this Annex and recorded in accordance with paragraph 4.3.1 by applying the definitions of characteristic engine speeds in accordance with paragraph 7.4.6. of Annex 4 to UN/ECE Regulation 49 Rev.06. If dn44 is the smallest of the three values, the 6 additional target engine speeds shall be determined by dividing each of the two ranges, one from nidle to nA and the other from nB to n95h, into 4 equidistant sections. If dn35 is the smallest of the three values, the 6 additional target engine speeds shall be determined by dividing the range from nidle to nA into 3 equidistant sections and the range from nB to n95h, into 5 equidistant sections. If dn53 is the smallest of the three values, the 6 additional target engine speeds shall be determined by dividing the range from nidle to nA into 5 equidistant sections and the range from nB to n95h, into 3 equidistant sections. Figure 1 exemplarily illustrates the definition of the target engine speed setpoints according to subpoint (1) above. The 11 target torque setpoints are defined by 2 base target torque setpoints and 9 additional target torque setpoints. The 2 base target torque setpoints are defined by zero engine torque and the maximum engine full load of the CO2-parent engine determined in accordance with paragraph 4.3.1. (overall maximum torque Tmax_overall). The 9 additional target torque setpoints are determined by dividing the range from zero torque to overall maximum torque, Tmax_overall, into 10 equidistant sections. All target torque setpoints at a particular target engine speed setpoint that exceed the limit value defined by the full load torque value at this particular target engine speed setpoint minus 5 percent of Tmax_overall, shall be replaced with the full load torque value at this particular target engine speed setpoint. Figure 2 exemplarily illustrates the definition of the target torque setpoints. Gaseous pollutants according to the definitions in UN/ECE Regulation 49 Rev.06. Particulate pollutants and ammonia emissions are not required to be monitored during the FCMC testrun. The measurement of gaseous pollutants shall be carried out in accordance with paragraphs 7.5.1, 7.5.2, 7.5.3, 7.5.5, 7.7.4, 7.8.1, 7.8.2, 7.8.4 and 7.8.5 of Annex 4 to UN/ECE Regulation 49 Rev.06. For the purpose of paragraph 7.8.4 of Annex 4 to UN/ECE Regulation 49 Rev.06, the term ‘test cycle’ in the paragraph referred to shall be the complete sequence from preconditioning in accordance with paragraph 4.3.5.4 to ending of the test sequence in accordance with paragraph 4.3.5.5. The dilution system, if applicable, and the engine shall be started and warmed up in accordance with paragraph 7.4.1. of Annex 4 to UN/ECE Regulation 49 Rev.06. After warm-up is completed, the engine and sampling system shall be preconditioned by operating the engine for 20 minutes at mode 9, as defined in Table 1 of paragraph 7.2.2. of Annex 4 to UN/ECE Regulation 49 Rev.06, while simultaneously operating the dilution system. The engine full load curve of the CO2-parent engine of the engine CO2-family and recorded in accordance with paragraph 4.3.1 shall be used for the denormalization of the reference values of mode 9 performed in accordance with paragraphs 7.4.6, 7.4.7 and 7.4.8 of Annex 4 to UN/ECE Regulation 49 Rev.06. Directly after completion of preconditioning, the target values for engine speed and torque shall be changed linearly within 20 to 46 seconds to match the first target setpoint of the test sequence according to paragraph 4.3.5.5. If the first target setpoint is reached within less than 46 seconds, the remaining time up to 46 seconds shall be used for stabilization. The test sequence consists of steady state target setpoints with defined engine speed and torque at each target setpoint in accordance with paragraph 4.3.5.2 and defined ramps to move from one target setpoint to the next. The highest target torque setpoint at each target engine speed shall be operated with maximum operator demand. The first target setpoint is defined at the highest target engine speed setpoint and highest target torque setpoint. The engine speed mean value shall be held at the target engine speed setpoint within ± 1 percent of the highest target engine speed. Except for the points at full load, the engine torque mean value shall be held at the target torque setpoint within a tolerance of ± 20 Nm or ± 2 percent of the overall maximum torque, Tmax_overall, whichever is greater. The recorded values in accordance with paragraph 4.3.5.3 shall be stored as averaged value over the period of 30 ± 1 seconds. The remaining period of 10 ± 1 seconds may be used for data post-processing and storage if necessary. During this period the engine target setpoint shall be kept. After the measurement at one target setpoint is completed, the target value for engine speed shall be kept constant within ± 20 min– 1 of the target engine speed setpoint and the target value for torque shall be decreased linearly within 20±1 seconds to match the next lower target torque setpoint. Then the measurement shall be performed according to subpoint (1). After the zero torque setpoint has been measured in subpoint (1), the target engine speed shall be decreased linearly to the next lower target engine speed setpoint while at the same time the target torque shall be increased linearly to the highest target torque setpoint at the next lower target engine speed setpoint within 20 to 46 seconds. If the next target setpoint is reached within less than 46 seconds, the remaining time up to 46 seconds shall be used for stabilization. Then the measurement shall be performed by starting the the stabilization procedure according to subpoint (1) and afterwards the target torque setpoints at constant target engine speed shall be adjusted according to subpoint (2). Figure 3 illustrates the three different steps to be performed at each measurement setpoint for the test according to subpoint (1) above. Figure 4 exemplarily illustrates the sequence of steady state measurement setpoints to be followed for the test. Gaseous pollutants in accordance with paragraph 4.3.5.3 shall be monitored during the FCMC. The definitions of characteristic engine speeds in accordance with paragraph 7.4.6. of Annex 4 to UN/ECE R.49.06 shall apply. The control area for emission monitoring during the FCMC shall be determined in accordance with paragraphs 4.3.5.6.1.1 and 4.3.5.6.1.2. The engine speed range for the control area shall be defined based on the engine full load curve of the CO2-parent engine of the engine CO2-family defined in accordance with Appendix 3 to this Annex and recorded in accordance with paragraph 4.3.1. The control area shall include all engine speeds greater than or equal to the 30th percentile cumulative speed distribution, determined from all engine speeds including idle speed sorted in ascending order, over the hotstart WHTC test cycle performed in accordance with paragraph 4.3.3 (n30) for the engine full load curve referred to the subpoint (1). The lower boundary of the engine torque range for the control area shall be defined based on the engine full load curve of the engine with the lowest rating of all engines within the engine CO2-family and recorded in accordance with paragraph 4.3.1. The control area shall include all engine load points with a torque value greater than or equal to 30 percent of the maximum torque value determined from the engine full load curve referred to in subpoint (1). Notwithstanding the provisions of subpoint (2), speed and torque points below 30 percent of the maximum power value, determined from the engine full load curve referred to in subpoint (1), shall be excluded from the control area. Notwithstanding the provisions of subpoints (2) and (3), the upper boundary of the control area shall be based on the engine full load curve of the CO2-parent engine of the engine CO2-family defined in accordance with Appendix 3 to this Annex and recorded in accordance with paragraph 4.3.1. The torque value for each engine speed determined from the engine full load curve of the CO2-parent engine shall be increased by 5 percent of the overall maximum torque, Tmax_overall, defined in accordance with paragraph 4.3.5.2.2. The modified increased engine full load curve of the CO2-parent engine shall be used as upper boundary of the control area. 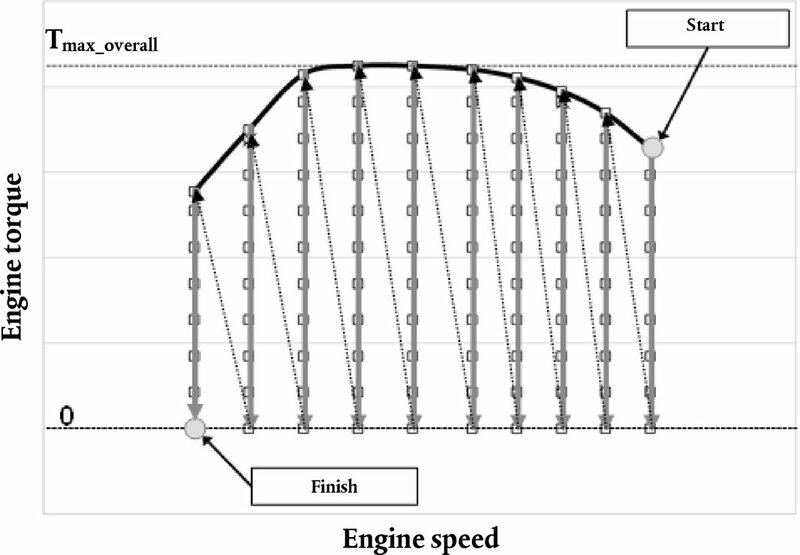 Figure 5 exemplarily illustrates the definition of the engine speed, torque and power range for the control area. The control area defined in accordance with paragraph 4.3.5.6.1 shall be divided into a number of grid cells for emission monitoring during the FCMC. The outer boundaries of the grids are aligned to the control area defined according to paragraph 4.3.5.6.1. 2 vertical lines spaced at equal distance between engine speeds n30 and 1,1 times n95h for 9 cell grids, or 3 vertical lines spaced at equal distance between engine speeds n30 and 1,1 times n95h for 12 cell grids. All engine speed values in min-1 and all torque values in Newtonmeters defining the boundaries of the grid cells shall be rounded to 2 places to the right of the decimal point in accordance with ASTM E 29-06. Figure 6 exemplarily illustrates the definition of the grid cells for the control area in the case of 9 cell grid. The specific mass emissions of the gaseous pollutants shall be determined as average value for each grid cell defined in accordance with paragraph 4.3.5.6.2. The average value for each grid cell shall be determined as arithmetical mean value of the specific mass emissions over all engine speed and torque points measured during the FCMC located within the same grid cell. The specific mass emissions of the single engine speed and torque measured during the FCMC shall be determined as averaged value over the 30 ± 1 seconds measurement period defined in accordance with subpoint (1) of paragraph 4.3.5.5. If an engine speed and torque point is located directly on a line that separates different grid cells from each other, this engine speed and load point shall be taken into account for the average values of all adjacent grid cells. The calculation of the total mass emissions of each gaseous pollutant for each engine speed and torque point measured during the FCMC, mFCMC,i in grams, over the 30 ± 1 seconds measurement period in accordance with subpoint (1) of paragraph 4.3.5.5 shall be carried out in accordance with paragraph 8 of Annex 4 to UN/ECE Regulation 49 Rev.06. The actual engine work for each engine speed and torque point measured during the FCMC, WFCMC,i in kWh, over the 30 ± 1 seconds measurement period in accordance with subpoint (1) of paragraph 4.3.5.5 shall be determined from the engine speed and torque values recorded in accordance with paragraph 4.3.5.3. A linear regression analysis of the actual values of engine speed (nact), engine torque (Mact) and engine power (Pact) on the respective reference values (nref, Mref, Pref) shall be performed for the FCMC. The actual values for nact, Mact and Pact shall be the determined from the values recorded in accordance with paragraph 4.3.5.3. The ramps to move from one target setpoint to the next shall be excluded from this regression analysis. To minimize the biasing effect of the time lag between the actual and reference cycle values, the entire engine speed and torque actual signal sequence may be advanced or delayed in time with respect to the reference speed and torque sequence. If the actual signals are shifted, both speed and torque shall be shifted by the same amount in the same direction. The method of least squares shall be used for the regression analysis in accordance with paragraphs A.3.1 and A.3.2 of Appendix 3 to Annex 4 to UN/ECE Regulation 49 Rev.06, with the best-fit equation having the form as defined in paragraph 7.8.7 of Annex 4 to UN/ECE Regulation 49 Rev.06. It is recommended that this analysis be performed at 1 Hz. For the purposes of this regression analysis only, omissions of points are permitted where noted in Table 4 (Permitted point omissions from regression analysis) of Annex 4 to UN/ECE Regulation 49 Rev.06 before doing the regression calculation. Additionally, all engine torque and power values at points with maximum operator demand shall be omitted for the purposes of this regression analysis only. However, points omitted for the purposes of regression analysis shall not be omitted for any other calculations in accordance with this Annex. Point omission may be applied to the whole or to any part of the cycle. For the data to be considered valid, the criteria of Table 3 (Regression line tolerances for the WHSC) of Annex 4 to UN/ECE Regulation 49 Rev.06 shall be met. The data obtained from the FCMC tests is valid if the specific mass emissions of the regulated gaseous pollutants determined for each grid cell in accordance with paragraph 4.3.5.6.3 meet the applicable limits for gaseous pollutants defined in paragraph 5.2.2 of Annex 10 to UN/ECE Regulation 49 Rev.06. In the case that the number of engine speed and torque points within the same grid cell is less than 3, this paragraph shall not apply for that specific grid cell. All calculations defined in this paragraph shall be performed specifically for each engine within one engine CO2-family. Total engine work over a cycle or a defined period shall be determined from the recorded values of engine power determind in accordance with paragraph 3.1.2 and paragraphs 6.3.5. and 7.4.8. of Annex 4 to UN/ECE Regulation 49 Rev.06. Any recorded negative values for the fuel consumption shall be used directly and shall not be set equal to zero for the calculations of the integrated value. The correction and balancing factors, which have to be provided as input for the simulation tool, are calculated by the engine pre-processing tool based on the measured specific fuel consumption figures of the engine determined in accordance with paragraphs 5.3.1 and 5.3.2. In the case that reference fuel of the type B7 (Diesel /CI) in accordance with paragraph 3.2 was used during testing, the standardization correction in accordance with paragraph 5.3.3.1 shall not be performed and the corrected value, SFCWHSC,corr, shall be set to the uncorrected value SFCWHSC. For engines equipped with exhaust after-treatment systems that are regenerated on a periodic basis defined in accordance with paragraph 6.6.1 of Annex 4 to UN/ECE Regulation 49 Rev.06, fuel consumption shall be adjusted to account for regeneration events by a correction factor. This correction factor, CFRegPer, shall be determined in accordance with paragraph 6.6.2 of Annex 4 to UN/ECE Regulation 49 Rev.06. For engines equipped with exhaust after-treatment systems with continuous regeneration, defined in accordance with paragraph 6.6 of Annex 4 to UN/ECE Regulation 49 Rev.06, no correction factor shall be determined and the value of the factor CFRegPer shall be set to 1. The engine full load curve recorded in accordance with paragraph 4.3.1 shall be used for the denormalization of the WHTC reference cycle and all calculations of reference values performed in accordance with paragraphs 7.4.6, 7.4.7 and 7.4.8 of Annex 4 to UN/ECE Regulation 49 Rev.06. In addition to the provisions defined in Annex 4 to UN/ECE Regulation 49 Rev.06 the actual fuel mass flow consumed by the engine in accordance with paragraph 3.4 shall be recorded for each WHTC hot start test performed in accordance with paragraph 6.6.2 of Annex 4 to UN/ECE Regulation 49 Rev.06. The engine pre-processing tool shall be executed for each engine within one engine CO2-family using the input defined in paragraph 6.1. The output data of the engine pre-processing tool shall be the final result of the engine test procedure and shall be documented. The following input data shall be generated by the test procedures specified in this Annex and shall be the input to the engine pre-processing tool. The input data shall be the engine full load curve of the CO2-parent engine of the engine CO2-family defined in accordance with Appendix 3 to this Annex and recorded in accordance with paragraph 4.3.1. In the case that upon request of the manufacturer the provisions defined in Article 15(5) of this Regulation are applied, the engine full load curve of that specific engine recorded in accordance with paragraph 4.3.1 shall be used as input data. The input data shall be provided in the file format of ‘comma separated values’ with the separator character being the Unicode Character ‘COMMA’ (U+002C) (‘,’). The first line of the file shall be used as a header and not contain any recorded data. The recorded data shall start from the second line of the file. The first column of the file shall be the engine speed in min– 1 rounded to 2 places to the right of the decimal point in accordance with ASTM E 29-06. The second column shall be the torque in Nm rounded to 2 places to the right of the decimal point in accordance with ASTM E 29-06. The input data shall be the engine full load curve of the engine recorded in accordance with paragraph 4.3.1. The input data shall be the engine motoring curve of the CO2-parent engine of the engine CO2-family defined in accordance with Appendix 3 to this Annex and recorded in accordance with paragraph 4.3.2. In the case that upon request of the manufacturer the provisions defined in Article 15(5) of this Regulation are applied, the engine motoring curve of that specific engine recorded in accordance with paragraph 4.3.2 shall be used as input data. The input data shall be the values of engine speed, engine torque and fuel massflow determined for the CO2-parent engine of the engine CO2-family defined in accordance with Appendix 3 to this Annex and recorded in accordance with paragraph 4.3.5. In the case that upon request of the manufacturer the provisions defined in Article 15(5) of this Regulation are applied, the values of engine speed, engine torque and fuel massflow determined for that specific engine recorded in accordance with paragraph 4.3.5 shall be used as input data. The input data shall only consist of the average measurement values of engine speed, engine torque and fuel massflow over the 30 ± 1 seconds measurement period determined in accordance with subpoint (1) of paragraph 4.3.5.5. The first column of the file shall be the engine speed in min– 1 rounded to 2 places to the right of the decimal point in accordance with ASTM E 29-06. The second column shall be the torque in Nm rounded to 2 places to the right of the decimal point in accordance with ASTM E 29-06. The third column shall be the fuel massflow in g/h rounded to 2 places to the right of the decimal point in accordance with ASTM E 29-06. The input data shall be the three values for specific fuel consumption over the different sub-cycles of the WHTC – urban, rural and motorway – in g/kWh determined in accordance with paragraph 5.3.1. The values shall be rounded to 2 places to the right of the decimal point in accordance with ASTM E 29-06. The input data shall be the two values for specific fuel consumption over the hotstart and coldstart WHTC in g/kWh determined in accordance with paragraph 5.3.2. The input data shall be the correction factor CFRegPer determined in accordance with paragraph 5.4. For engines equipped with exhaust after-treatment systems with continuous regeneration, defined in accordance with paragraph 6.6.1 of Annex 4 to UN/ECERegulation 49 Rev.06, this factor shall be set to 1 in accordance with paragraph5.4. The value shall be rounded to 2 places to the right of the decimal point in accordance with ASTM E 29-06. The input data shall be the NCV of the test fuel in MJ/kg determined in accordance with paragraph 3.2. The value shall be rounded to 3 places to the right of the decimal point in accordance with ASTM E 29-06. The input data shall be the type of the test fuel selected in accordance with paragraph 3.2. The input data shall be the engine idle speed, nidle, in min– 1 of the CO2-parent engine of the engine CO2-family defined in accordance with Appendix 3 to this Annex as declared by the manufacturer in the application for certification in the information document drawn up in accordance with the model set out in Appendix 2. In the case that upon request of the manufacturer the provisions defined in Article 15(5) of this Regulation are applied, the engine idle speed of that specific engine shall be used as input data. The value shall be rounded to the nearest whole number in accordance with ASTM E 29-06. The input data shall be the engine idle speed, nidle, in min– 1 of the engine as declared by the manufacturer in the application for certification in the information document drawn up in accordance with the model set out in Appendix 2 to this Annex. The input data shall be the displacement in ccm of the engine as declared by the manufacturer at the application for certification in the information document drawn up in accordance with the model set out in Appendix 2 to this Annex. The input data shall be the rated speed in min– 1 of the engine as declared by the manufacturer at the application for certification in point 3.2.1.8. of the information document in accordance with Appendix 2 to this Annex. The input data shall be the rated power in kW of the engine as declared by the manufacturer at the application for certification in point 3.2.1.8. of the information document in accordance with Appendix 2 to this Annex. The input data shall be the name of the engine manufacturer as a sequence of characters in ISO8859-1 encoding. The input data shall be the name of the engine model as a sequence of characters in ISO8859-1 encoding. The input data shall be an unique identifier of the technical report compiled for the type approval of the specific engine. This identifier shall be provided as a sequence of characters in ISO8859-1 encoding. (1) ‘Accuracy’ means the deviation of the analyzer reading from a reference value which is traceable to a national or international standard. (2) ‘Rise time’ means the difference in time between the 10 percent and 90 percent response of the final analyzer reading (t90 – t10). (3) The ‘max calibration’ values shall be 1,1 times the maximum predicted value expected during all testruns for the respective measurement system. of a certificate on CO2 emission and fuel consumption related properties of an engine family in accordance with Commission Regulation (EU) 2017/2400. Commission Regulation (EU) 2017/2400 as last amended by …. Letters A, B, C, D, E corresponding to engine CO2-family members shall be replaced by the actual engine CO2-family members' names. In case when for a certain engine characteristic same value/description applies for all engine CO2-family members the cells corresponding to A-E shall be merged. In case the engine CO2-family consists of more than 5 members, new columns may be added. The ‘Appendix to information document’ shall be copied and filled in for each engine within an CO2-family separately. Explanatory footnotes can be found at the very end of this Appendix. Delete where not applicable (there are cases where nothing needs to be deleted when more than one entry is applicable). This value shall be calculated and rounded off to the nearest cm3. Determined in accordance with the requirements of Regulation No. 85. Please fill in here the upper and lower values for each variant. To be documented in case of a single OBD engine family and if not already documented in the documentation package(s) referred to in line 3.2.12.2.7.0.4. of Part 1 of this Appendix. If auxiliaries/equipment not required are fitted to the engine. (1) Specify the tolerance; to be within ± 3 % of the values declared by the manufacturer. The engine CO2-family, as determined by the manufacturer, shall comply with the membership criteria defined in accordance with paragraph 5.2.3. of Annex 4 to UN/ECE Regulation 49 Rev.06. An engine CO2-family may consist of only one engine. In addition to those membership criteria, the engine CO2-family, as determined by the manufacturer, shall comply with the membership criteria listed in paragraph 1.1 to 1.9 of this Appendix. In addition to the parameters listed below, the manufacturer may introduce additional criteria allowing the definition of families of more restricted size. These parameters are not necessarily parameters that have an influence on the level of fuel consumption. 1.7.1. 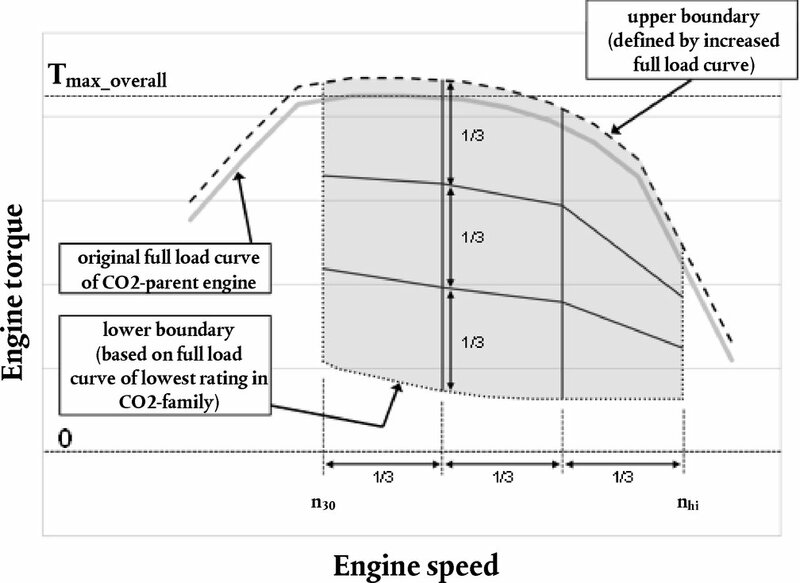 The torque values at each engine speed of the full load curve of the CO2-parent engine determined in accordance with paragraph 4.3.1. shall be equal or higher than for all other engine within the same CO2-family at the same engine speed over the whole engine speed range recorded. 1.7.2. 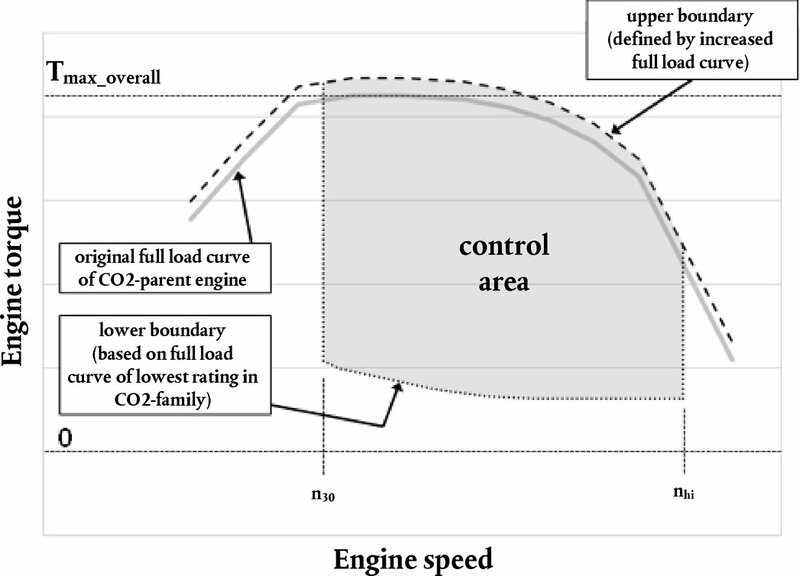 The torque values at each engine speed of the full load curve of the engine with the lowest power rating of all engines within the engine CO2-family determined in accordance with paragraph 4.3.1. shall be equal or lower than for all other engines within the same CO2-family at the same engine speed over the whole engine speed range recorded. 1.8.1. The engine idle speed, nidle, of the CO2-parent engine as declared by the manufacturer at the application for certification in the information document in accordance with Appendix 2 to this Annex shall be equal or lower than for all other engines within the same CO2-family. 1.8.2. The engine speed n95h of all other engines than the CO2-parent engine within the same CO2-family, determined from the engine full load curve recorded in accordance with paragraph 4.3.1 by applying the definitions of characteristic engine speeds in accordance with paragraph 7.4.6. of Annex 4 to UN/ECE Regulation 49 Rev.06, shall not deviate from the engine speed n95h of the CO2-parent engine by more than ± 3 percent. 1.8.3. The engine speed n57 of all other engines than the CO2-parent engine within the same CO2-family, determined from the engine full load curve recorded in accordance with paragraph 4.3.1 by applying the definitions in accordance with paragraph 4.3.5.2.1, shall not deviate from the engine speed n57 of the CO2-parent engine by more than ± 3 percent. 1.9.1. All engines within the same CO2-family shall have a minimum number of 54 mapping points of the fuel consumption map located below their respective engine full load curve determined in accordance with paragraph 4.3.1. 2.1. Highest power rating of all engines within the engine CO2-family. 1.1 Conformity of CO2 emissions and fuel consumption related properties shall be checked on the basis of the description in the certificates set out in Appendix 1 to this Annex and on the basis of the description in the information document set out in Appendix 2 to this Annex. 1.2 If an engine certificate has had one or more extensions, the tests shall be carried out on the engines described in the information package relating to the relevant extension. 1.3 All engines subject to tests shall be taken from the series production meeting the selection criteria according to paragraph 3 of this Appendix. 1.4 The tests may be conducted with the applicable market fuels. However, at the manufacturer's request, the reference fuels specified in paragraph 3.2 may be used. 1.5 If tests for the purpose of conformity of CO2 emissions and fuel consumption related properties of gas engines (natural gas, LPG) are conducted with market fuels the engine manufacturer shall demonstrate to the approval authority the appropriate determination of the gas fuel composition for the determination of the NCV according to paragraph 4 of this Appendix by good engineering judgement. 2.1 0,05 percent of all engines produced in the past production year within the scope of this regulation shall represent the basis to derive the number of engine CO2-families and number of engines within those CO2-families to be tested annually for verifying conformity of the certified CO2 emissions and fuel consumption related properties. The resulting figure of 0,05 percent of relevant engines shall be rounded to the nearest whole number. This result shall be called nCOP,base. 2.2 Notwithstanding the provisions in point 2.1, a minimum number of 30 shall be used for nCOP,base. 2.3 The resulting figure for nCOP,base determined in accordance with points 2.1 and 2.2 of this Appendix shall be divided by 10 and the result rounded to the nearest whole number in order to determine the number of engine CO2-families to be tested annually, nCOP,fam, for verifying conformity of the certified CO2 emissions and fuel consumption related properties. 2.4 In the case that a manufacturer has less CO2-families than nCOP,fam determined in accordance with point 2.3, the number of CO2-families to be tested, nCOP,fam, shall be defined by the total number of CO2-families of the manufacturer. From the number of engine CO2-families to be tested determined in accordance with paragraph 2 of this Appendix, the first two CO2-families shall be those with the highest production volumes. The remaining number of engine CO2-families to be tested shall be randomly selected from all existing engine CO2-families and shall be agreed between the manufacturer and the approval authority. The minimum number of engines to be tested for each engine CO2-family, nCOP,min, shall be determined by dividing nCOP,base by nCOP,fam, both values determined in accordance with point 2. If the resulting value for nCOP,min is smaller than 4 it shall be set to 4. For each of the engine CO2-families determined in accordance with paragraph 3 of this Appendix a minimum number of nCOP,min engines within that family shall be tested in order to reach a pass decision in accordance with paragraph 9 of this Appendix. The number of testruns to be performed within an engine CO2-family shall be randomly assigned to the different engines within that CO2-family and this assignment shall be agreed between the manufacturer and the approval authority. Conformity of the certified CO2 emissions and fuel consumption related properties shall be verified by testing the engines in the WHSC test in accordance with paragraph 4.3.4. The laboratory test conditions in accordance with paragraph 3.1.1 of this Annex. The conditions in accordance with paragraph 3.1.1 are recommended and shall not be mandatory. Deviations may occur under certain ambient conditions at the testing site and should be minimized by the use of good engineering judgment. In case reference fuel of the type B7 (Diesel / CI) in accordance with paragraph 3.2 of this Annex is used, the determination of the NCV in accordance with paragraph 3.2 of this Annex shall not be required. In case market fuel or reference fuel other than B7 (Diesel / CI) is used, the NCV of the fuel shall be determined in accordance with the applicable standards defined in Table 1 of this Annex. With exemption of gas engines the NCV measurement shall be performed by only one lab independent from the engine manufacturer instead of two as required in accordance with paragraph 3.2 of this Annex. NCV for reference gas fuels (G25, LPG fuel B) shall be calculated according to the applicable standards in Table 1 of this Annex from the fuel analysis submitted by the reference gas fuel supplier. The lubricating oil shall be the one filled during engine production and shall not be changed for the purpose of testing conformity of CO2 emissions and fuel consumption related properties. 5.1 The tests shall be carried out on newly manufactured engines taken from the series production which have a maximum run-in time of 15 hours before the testrun for the verification of conformity of the certified CO2 emissions and fuel consumption related properties in accordance with paragraph 4 of this Appendix is started. 5.2 At the request of the manufacturer, the tests may be carried out on engines which have been run-in up to a maximum of 125 hours. In this case, the running-in procedure shall be conducted by the manufacturer who shall not make any adjustments to those engines. The specific fuel consumption shall be measured over the WHSC test once on the newly manufactured engine with a maximum run-in time of 15 hours in accordance with point 5.1 of this Appendix and in the second test before the maximum of 125 hours set in point 5.2 of this Appendix on the first engine tested. The values for the specific fuel consumption of both tests shall be adjusted to a corrected value in accordance with paragraphs 7.2 and 7.3 of this Appendix for the respective fuel used during each of the two tests. The evolution coefficient of the fuel consumption shall be calculated by dividing the corrected specific fuel consumption of the second test by the corrected specific fuel consumption of the first test. The evolution coefficient may have a value less than one. 5.4 If the provisions defined in point 5.3 (b) of this Appendix are applied, the subsequent engines selected for testing of conformity of CO2 emissions and fuel consumption related properties shall not be subjected to the running-in procedure, but their specific fuel consumption over the WHSC determined on the newly manufactured engine with a maximum run-in time of 15 hours in accordance with point 5.1 of this Appendix shall be multiplied by the evolution coefficient. 5.6. Instead of using a running-in procedure in accordance with points 5.2 to 5.5 of this Appendix, a generic evolution coefficient of 0,99 may be used at the request of the manufacturer. In this case the specific fuel consumption over the WHSC determined on the newly manufactured engine with a maximum run-in time of 15 hours in accordance with point 5.1 of this Appendix shall be multiplied by the generic evolution coefficient of 0,99. 5.7 If the evolution coefficient in accordance with point 5.3 (b) of this Appendix is determined using the parent engine of an engine family according to paragraphs 5.2.3. and 5.2.4. of Annex 4 to Regulation UN/ECE R.49.06, it may be carried across to all members of any CO2-family belonging to the same engine family according to paragraph 5.2.3. of Annex 4 to Regulation UN/ECE R.49.06. The target value to assess the conformity of the certified CO2 emissions and fuel consumption related properties shall be the corrected specific fuel consumption over the WHSC, SFCWHSC,corr, in g/kWh determined in accordance with paragraph 5.3.3 and documented in the information document as part of the certificates set out in Appendix 2 to this Annex for the specific engine tested. 7.1 The specific fuel consumption over the WHSC, SFCWHSC, shall be determined in accordance with paragraph 5.3.3 of this Annex from the testruns performed in accordance with paragraph 4 of this Appendix. At the request of the manufacturer the specific fuel consumption value determined shall be modified by applying the provisions defined in points 5.3 to 5.6 of this Appendix. 7.2 If market fuel was used during testing in accordance with point 1.4 of this Appendix, the specific fuel consumption over the WHSC, SFCWHSC, determined in point 7.1 of this Appendix shall be adjusted to a corrected value, SFCWHSC,corr, in accordance with paragraph 5.3.3.1 of this Annex. 7.3 If reference fuel was used during testing in accordance with point 1.4 of this Appendix the special provisions defined in paragraph 5.3.3.2 of this Annex shall be applied to the value determined in point 7.1 of this Appendix. 7.4 The measured emission of gaseous pollutants over the WHSC performed in accordance with paragraph 4 shall be adjusted by application of the appropriate deterioration factors (DF's) for that engine as recorded in the Addendum to the EC type-approval certificate granted in accordance with Commission Regulation (EU) No 582/2011. For diesel engines, the limit values for the assessment of conformity of one single engine tested shall be the target value determined in accordance with point (6) + 3 percent. For gas engines, the limit values for the assessment of conformity of one single engine tested shall be the target value determined in accordance with point (6) + 4 percent. 9.1 The emission test results over the WHSC determined in accordance with point 7.4 of this Appendix shall meet the applicable limits values defined in Annex I to Regulation (EC) No 595/2009 for all gaseous pollutants except ammonia, otherwise the test shall be considered void for the assessment of conformity of the certified CO2 emissions and fuel consumption related properties. 9.2 A single test of one engine tested in accordance with paragraph 4 of this Appendix shall be considered as nonconforming if the actual value in accordance with paragraph 7 of this Appendix is higher than the limit values defined in accordance with paragraph 8 of this Appendix. 9.3 For the current sample size of engines tested within one CO2-family in accordance with paragraph 4 of this Appendix the test statistic quantifying the cumulative number of nonconforming tests in accordance with point 9.2 of this Appendix at the nth test shall be determined. If the cumulative number of nonconforming tests at the nth test determined in accordance with point 9.3 of this Appendix is less than or equal to the pass decision number for the sample size given in Table 4 of Appendix 3 to UN/ECE Regulation 49 Rev.06, a pass decision is reached. If the cumulative number of nonconforming tests at the nth test determined in accordance with point 9.3 of this Appendix is greater than or equal to the fail decision number for the sample size given in Table 4 of Appendix 3 to UN/ECE Regulation 49 Rev.06, a fail decision is reached. Otherwise, an additional engine is tested in accordance with paragraph 4 of this Appendix and the calculation procedure in accordance with point 9.3 of this Appendix is applied to the sample increased by one more unit. 9.4 If neither a pass nor a fail decision is reached, the manufacturer may at any time decide to stop testing. In that case a fail decision is recorded. Install the fan according to product instruction before the test starts. Warm up phase: The engine shall be warmed up according to the recommendation of the manufacturer and by practicing good engineering judgement (eg operating the engine for 20 minutes at mode 9, as defined in Table 1 of paragraph 7.2.2. of Annex 4 to UN/ECE Regulation 49 Rev.06). Stabilization phase: After the warm-up or optional warmup step (v) is completed the engine shall be operated with minimum operator demand (motoring) at engine speed npref for 130 ± 2 seconds with the fan disengaged (nfan_disengage < 0,25 * nengine * rfan) The first 60 ± 1 seconds of this period are considered as a stabilization period, during which the actual engine speed shall be held within ±5 min– 1 of npref. Measurement phase: During the following period of 60 ± 1 seconds the actual engine speed shall be held within ± 2 min– 1 of npref and the coolant temperature within ± 5 °C while the torque for motoring the engine with the fan disengaged, the fan speed and the engine speed shall be recorded as an average value over this period of 60 ± 1 seconds. The remaining period of 10 ± 1 seconds shall be used for data post-processing and storage if necessary. Stabilization phase: After the optional warm-up is completed the engine shall be operated with minimum operator demand (motoring) at engine speed npref for 130 ± 2 seconds with the fan engaged (nfan_engage > 0,9 * nengine * rfan) The first 60 ± 1 seconds of this period are considered as a stabilization period, during which the actual engine speed shall be held within ± 5 min– 1 of npref. Measurement phase: During the following period of 60 ± 1 seconds the actual engine speed shall be held within ± 2 min– 1 of npref and the coolant temperature within ± 5 °C while the torque for motoring the engine with the fan engaged, the fan speed and the engine speed shall be recorded as an average value over this period of 60 ± 1 seconds. The remaining period of 10±1 seconds shall be used for data post-processing and storage if necessary. Steps (iii) to (vii) shall be repeated at engine speeds n95h and nhi instead of npref, with an optional warmup step (v) before each stabilization step if needed to maintain a stable coolant temperature (± 5 °C), according to good engineering judgement. If the standard deviation of all calculated Ci according to the equation below at the three speeds npref, n95h and nhi is equal or higher than 3 percent, the measurement shall be performed for all engine speeds defining the grid for the fuel mapping procedure (FCMC) according to paragraph 4.3.5.2.1. If the standard deviation of all calculated Ci at the three speeds npref, n95h and nhi is less than 3 %, an average value Cavg-fan determined over the three speeds npref, n95h and nhi shall be used for the fan constant. If the standard deviation of all calculated Ci at the three speeds npref, n95h and nhi is equal or higher than 3 %, individual values determined for all engine speeds according to point (ix) shall be used for the fan constant Cind-fan,i. The value of the fan constant for the actual engine speed Cfan, shall be determined by linear interpolation between the individual values Cind-fan,i of the fan constant. The mechanical power consumed by the fan shall be calculated from the engine torque for driving the fan and the actual engine speed. Mechanical power and engine torque shall be taken into account in accordance with paragraph 3.1.2. The electric power supplied externally to electric engine components shall be measured. This measured value shall be corrected to mechanical power by dividing it by a generic efficiency value of 0,65. This mechanical power and the corresponding engine torque shall be taken into account in accordance with paragraph 3.1.2.